Sideshow Collectibles has created one of the best Middle-earth collectibles you will ever find. As you’ll discover in our full review, this piece is simply amazing. Now, we’re teaming up with our friends at Sideshow Collectibles to give Ringers around the world a chance to bring Sauron home. 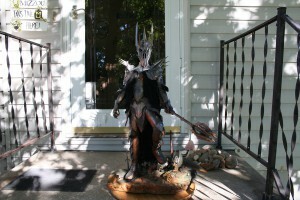 Giving yourself the chance of winning this exciting piece for your Middle-earth collection is easy. Simply follow the link below and enter your details: Name, Address, email address, and a contact number. (This way we can send this on to Sideshow and make sure your prize is delivered.) It’s that simple! The contest starts today, and entries close on October 10. So enter now!